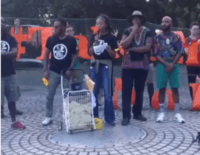 NEW ORLEANS, Louisiana — Activists with Black Lives Matter (BLM) and the organization Take ‘Em Down NOLA stormed the French Quarter’s iconic monument to President Andrew Jackson, demanding it be removed from the public square. 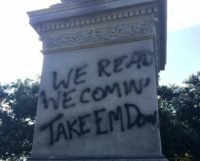 NEW ORLEANS, Louisiana – A group aligned with Black Lives Matter (BLM) again vandalized a New Orleans, Louisiana monument with fake blood. 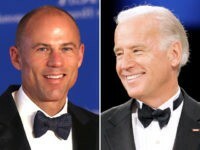 NEW ORLEANS, Louisiana – A case which called out the hypocrisy of the City of New Orleans’ plan to remove four Civil War-related monuments but not to remove one honoring Democratic President Andrew Jackson was thrown out by a federal judge this week. 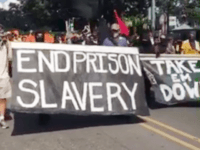 NEW ORLEANS, Louisiana – Following a march through New Orleans’ busiest street, the Black Lives Matter-aligned group ‘Take ‘Em Down Nola’ announced their list of “demands” from the City, saying they need $5 million annually to pay for education and salaries of African-American artists and historians. A Black Lives Matter-aligned organization called ‘Take ‘Em Down Nola’ stormed New Orleans’ Andrew Jackson monument demanding all monuments related to the Civil War come down across the city. The monument which sits at the heart of the city’s historic French Quarter. NEW ORLEANS, Louisiana – The ‘Take ‘Em Down Nola’ group, which has aligned itself with the Black Lives Matter movement, is now saying publicly they plan to tear down New Orleans’ most iconic monument in the city. NEW ORLEANS, Louisiana – An organization aligned with the Black Lives Matter movement is now threatening the City of New Orleans publicly, defacing historical monuments and demanding they be torn down. 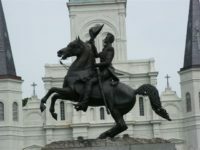 NEW ORLEANS, Louisiana – A group aligned with the Black Lives Matter movement is threatening to physically tear down New Orleans, Louisiana’s most famous French Quarter monument depicting President Andrew Jackson on a horse.